Flexography, often abbreviated to flexo, is a method of printing most commonly used for printing plastic roll banners and bags. This is the technology we use for printing plastic roll banners and plastic bags. A flexo print is achieved by creating a mirrored master of the required image as a 3D relief in a rubber or polymer material. We refer to these reliefs as "plates". A measured amount of ink is deposited upon the surface of the printing plate using an anilox roll. The print surface then rotates, contacting the poly which transfers the ink. Originally, flexo printing was very low quality. In the last few decades great advances have been made, including improvements to the plate material and the method of plate creation - usually photographic exposure followed by chemical etch, though also by direct laser engraving. Laser-etched anilox rolls also play a part in the improvement of print quality. Full color picture printing now occurs, and some of the finer presses available today in combination with a skilled operator allow quality that rivals the lithographic process. Flexo has an advantage over lithography in that it can use a wider range of inks and is good at printing on a variety of different materials. Flexo inks, unlike those used in lithography generally have low viscosity. This enables faster drying and as a result, faster production, which means low cost. Our printing presses average speeds of 450 linear feet per minute. Print cylinder sizes and repeat data available at time of quotation. "Repeat Length" - Repeat Length is the distance from the beginning of one logo impression to the next, measured along the length of the roll. Currently the maximum Repeat Length is 36". 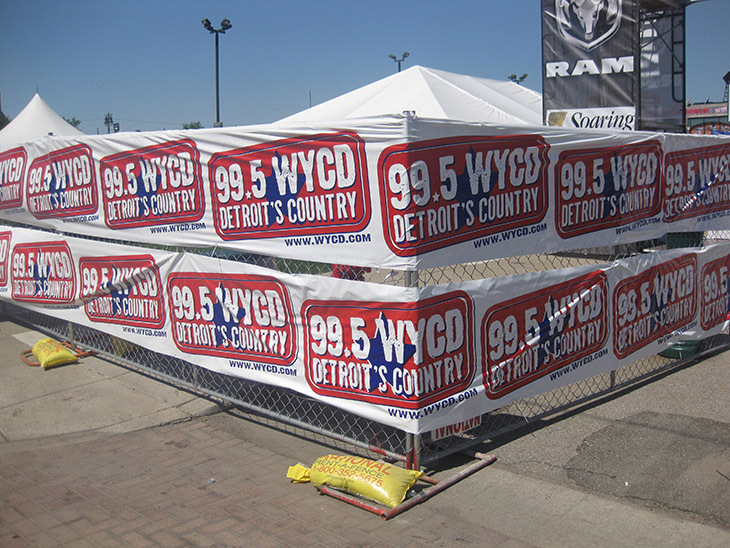 "Outdoor Usage" - Plastic roll banners are completely waterproof, unlike printed paper or corrugated products which lose their strength in moist or humid conditions and may allow ink to run when wet. "Separate images versus one continuous roll" - Plastic roll banners can be "converted to smaller rolls" using one continuous, uninterrupted length of poly. The banners can optionally be perforated between each image. The rolls can then be easily separated for individual use. "How many colors can our plastic roll banners be?" - Our printing presses can print up to 6 different ink colors, additional shades can be achieved by screening and overprinting colors. "Insuring the integrity of our ink color" - Because we match our colors to the PMS formula color guide, the only way we can guarantee color integrity on your plastic roll banners is to print on a white surface. Instead of printing on colored poly, we treat your job as requiring an extra color and print a large block of color to simulate colored poly. In addition to insuring color integrity, this strategy also helps us keep our costs down by not having to inventory multiple color films in multiple widths and multiple thicknesses. "Minimum Run Length" - Our minimum run length of plastic roll banners is 2,000 linear feet. Our average set-up time to mount plates, put in PMS matched inks, unmount plates and clean up press, hoses and ink stations is 1.5 hours per job down time. Since our presses runs at approximately 500' per minute, the average length of a minimum run of 2,000' is four minutes of press time.